While trying to lose weight many consider wheat based foods completely off-limits. The main reason why many people shy away from eating wheat based foods is that they contribute to weight gain. Pasta contains refined carbohydrates which get broken down easily thus get used up very fast and have very little nutritional value. After eating food high in refined carbohydrates one will experience a short burst of energy then you will feel sluggish and hungry again. This feeling will lead one to eat more and staying dormant. However, you can still eat pasta and still lose weight. Foods with low glycemic load are slower in increasing blood sugar levels. High sugar levels in the blood are dangerous as it increases the chances of one suffering from cardiovascular attacks. The human body stores sugar as fat in the body. This means that when one takes pasta with high glycemic load their weight increases rapidly plus they are at the risk of heart attacks. People who train heavily will tend to eat food high in glycemic load due to the energy required by intense physical activities. The excess sugars are converted into glucose and converted into energy needed by the body. However, if you are looking to lose weight the last thing you would want on your plate is food high in glycemic load. Many pasta diets are high in glycemic load and we should eat pasta in moderation. 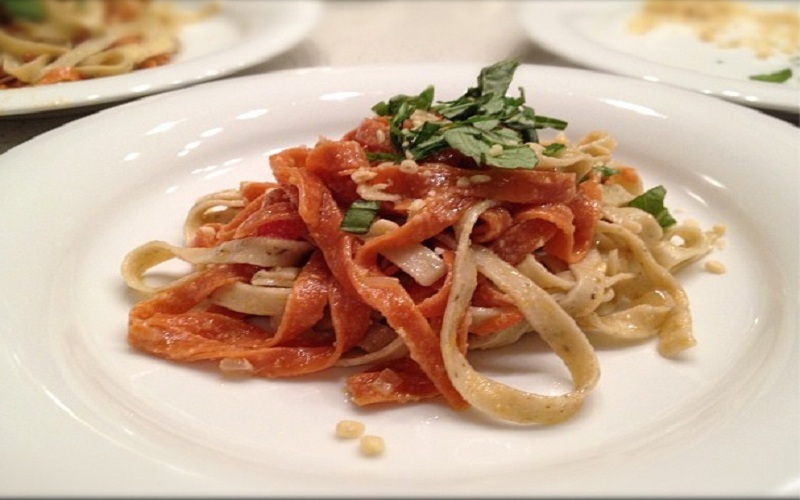 Here are some pasta foods with low glycemic load: Spaghetti, Noodles, Linguine, Vermicelli, Shells and Capellini. If your workout sessions are not that rigorous, eating food with the low glycemic load will help you lose weight. The body will burn up more carbohydrates than we are consuming. Have intense workout sessions If you find yourself eating pasta high in carbohydrates, having intense work sessions is your solution to burning the excess calories. If your job does not entail intense physical activity then you may find yourself gaining weight. Gaining weight is dangerous for your health and one has to watch their weight. Running for quite some team will burn a lot of energy. The excess sugars in your blood are quickly used and this prevents you from gaining weight. Have a timetable on when to jog and workout. Working out requires dedication and discipline which is not easy. You can look for a partner and stay true to the mission, in the long run, you will lose weight. Find a local gym if you cannot find friends to workout with and the instructor will give you the best workout routines. If you follow your routine religiously you will shed your extra weight and still enjoy pasta dishes. By cutting down your weight you are avoiding many weight -related complications. Work might be taking up a lot of time and you still can find ways to exercise. Cycling to and from might be a great way of cutting your weight. There are tons of ways how we can lose weight and stay in shape. Dieting is a great way of losing weight and nutritionist recommend it . Following a strict diet routine is tough since we have to restrain ourselves from eating anything and everything. While dieting we take foods that we do not normally take. Supplementing pasta with other high fiber foods helps in losing weight. Try adding vegetable into your sauces and more fruits in the salads. Many people prefer meaty sauces which contribute to gaining weight and increases the chances of one having a heart attack. Avoiding such sauces can help one lose weight. Vegetables and fruits are highly nutritious and physicians recommend that we include them in our meals. You can reduce the amount of pasta and increase vegetables in your diet. Food high in fibers helps in cutting weight and are healthy. Fiber makes you stay fuller and focused all along the day. Dieting should not translate to you starving yourself in order to cut weight. Staying hungry makes you grouchy and easily irritable, this can affect your relationship with other people. You can find many dieting tips online and you should avoid straining yourself when it comes to dieting. Creating a good dieting plan will help you stay on track and monitor your daily food intake. Add cereals and grains to your dough Experts recommend that we add cereals and grains to our pasta. Cereals such as millet, barley, rye, corn and whole grains can be included in the flour. To avoid destroying the texture of the dough, we should have the grains milled. Cereals and grains add vital minerals to the pasta such as omega -3 fatty acids, vitamins, phosphorous and fiber. Various recipes are available on how to mix the flour together and achieve great results. Cereals are a rich source of unsaturated fats and antioxidants which play a great role in reducing cholesterol levels . Antioxidants help in reducing weight by helping the body burn excess fats in the body. 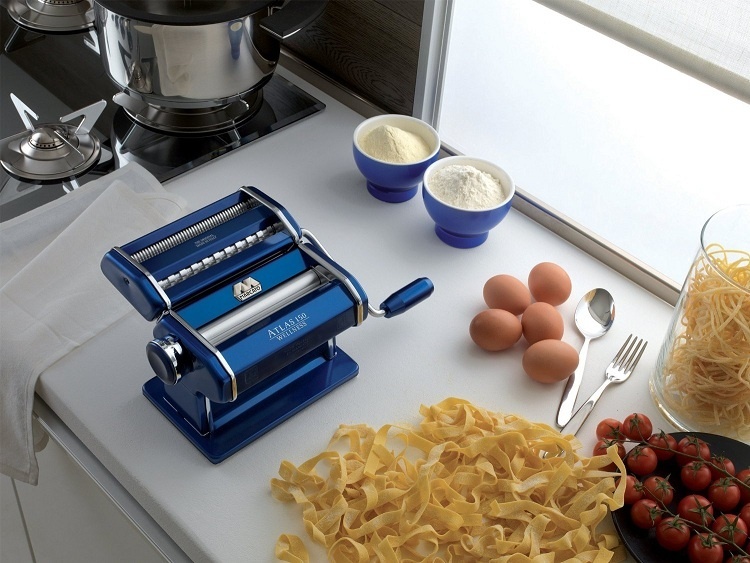 Various pasta makers will help you create delicious pasta. Cereals and grain are an excellent source of vitamins crucial for the body’s well-being. If you are not comfortable with changing your pasta, you might opt to use cereals in your soup or sauce. This ensures your diet is full of nutrients and beneficial to your weight loss journey. Losing weight is frustrating especially if we do not watch what we eat. Pasta is blamed for being ineffective in reducing weight and many people will avoid eating pasta totally. However, there are low glycemic load pasta recipes that one can try and still successfully lose weight. Combining the various weight loss methods discussed above will help one in the weight loss journey. If you are worried about adding weight then you can take pasta in moderation and stay fit. Low carb diet works hand in hand with working out in helping to lose weight and avoiding lifestyle diseases. Always supplement your diet with fruits, vegetables, and cereals so as to stay fit. Pasta makers come in different brands and types that vary in size, shape, price, functionality, and overall performance. A pasta maker can either be manual or electric; some can work both ways. Although seasoned folks prefer using manual pasta machines, electric pasta makers are quickly gaining popularity because they do (almost) everything for you especially if you’re new to making pasta. This makes electric pasta makers great for lots of pasta dishes. There’s also a slight difference between electric pasta makers and fully automatic pasta makers… but we will get to that later on as we go deeper into the topic. So what makes an electric pasta maker so special? And how do they come in handy when preparing various pasta dishes? This is an advantage for both veteran home pasta makers and beginners as well. Powered by an electric motor, electric pasta machines simplify dough rolling and cutting to kindergarten play. Easy peasy lemony squeezy! Using an average electric pasta maker still requires you to mix and knead the dough manually. The electric pasta machine then helps you with the rolling and cutting. All you have to do is place your small piece of square -shaped, hand -patted, flat dough between the rollers and slowly work it through using both hands. You can work on the dough while adjusting the thickness until you achieve the desired size of pasta. From there, you can effortlessly run the ready dough through the cutter to get the strands of pasta you want or you can push the dough out through an electric pasta extruder. As many home pasta makers will tell you, rolling the dough with a pin and cutting it to even strips is not an easy thing to do by hand. An electric pasta maker like the Lello (2730) Pro runs on a 300 watt motor to automatically mix the dough for you (up to 3lbs in 30 minutes flat! ), and also extrude the finished dough as linguine, spaghetti, maccheroni, fettuccine, lasagna, bucatini and angel hair! This gives you the opportunity to decorate your dining table with different pasta dishes every time you feel like eating pasta. Another automatic pasta machine that comes highly recommended is definitely the Phillips HR2357. Despite a similarity in mode of operation and service elivery between the Lello and the Phillips, the Phillip appears to be way ahead in terms of performance and reliability. Furthermore, the Phillips (2357) offers more pasta options such as pappardelle and tagliatelle in addition to all the options you can get with the Lello. One more thing you should probably also know about electric pasta machines with automatic mixers is that they give you the opportunity to play around with the ingredients you can include in your pasta recipes. You can go wild with herbs and veggies as much or as little as you want. The possibilities are virtually endless. Daily preparation of homemade pasta is almost an impossible feat for the average person to pull off without the help of a pasta machine. Consistency is also another major issue especially for those who are still new to making pasta from home. However, all this can be made possible by investing in a good pasta maker. Most electric pasta machines come with amazing recipes that are easy to replicate day in day out and the resulting pasta is (almost) always the same. The advantage of a well built pasta maker is that it can endure constant abuse even when used on a daily basis! And that’s without faltering in performance. Please note that many people just starting out on making pasta from home cannot produce the same quality dough even if they made two dough batches in immediate succession. However, a fully automatic pasta maker with a mixer can produce hundreds of batches of the same quality dough. Although pasta makers like the Phillips HR2357/05 come fully loaded with a mixer and an extruder to make things kindergarten easy for you, some of them like KitchenAid require you to purchase a separate stand mixer and 3 different head attachments for tagliatelle, flat -sheet pasta and linguine. However, you can avoid all this hustle by getting the KitchenAid KPEXTA extruder attachment that has 6 pasta shaping discs (plates) to help you expand the creativity on your pasta creations. You have a choice of up to 8 pasta shaping discs (dies) for different pastas with the Phillips and the Magic Mill DeLonghi pasta makers. The Magic Mill DeLonghi pasta shaping dies give you options for linguine, ravioli, lasagna, spaghetti, tagliatelle, fettuccine, biscuit, and macaroni. 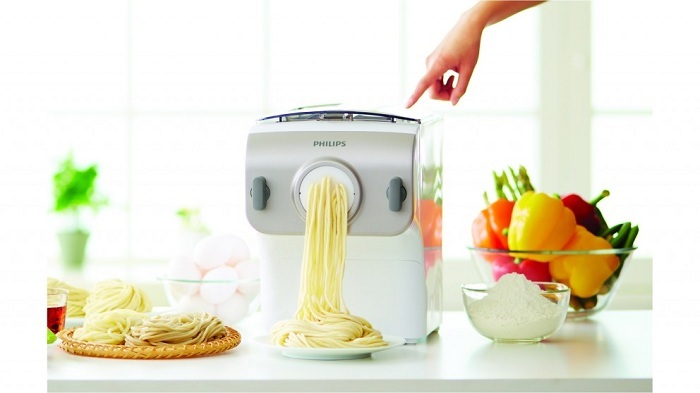 The Phillips pasta maker gives you options like spaghetti, angel hair, tagliatelle, pappardelle, lasagna, and penne. It also has a small drawer where you can store all your shaping discs. The Marcato Atlas Wellness pasta machine on the other hand is bought separately from the 2 -speed motor. This makes it easy to replace the electric part only if it breaks down. You can also continue using the pasta machine manually as you wait for your replacement motor to be delivered! This is more of a “hybrid” pasta maker since it can deliver the best of both worlds. More accessories include cleaning brushes, measuring cups, pasta cutters, and ravioli stamps. As mentioned earlier, rolling pasta dough is not a walk in the park! You have to go a few rounds with a rolling pin to get the precise pasta thickness you’re going and this is not even guaranteed. Plus, it takes a century to cut the pasta to precision especially if you’re making a big family -size batch at once; or different batches of differently shaped pasta. Automatic electric pasta makers take a lot of the pasta making process off your hands leaving you with more time to concentrate on the sauce or soup. You can use most of these automatic pasta makers to prepare your pasta from start to finish by simply pressing a few buttons. Better yet, you can prepare a complete pasta dish from scratch in less than an hour if you know what you’re doing. For instance, the Imperial pasta maker can make up to 12 different types of pasta from a pound and a half of dough in 10 minutes. Some pasta makers can do more than just make pasta. For instance, the Ronco Popeil P400 and the USEFUL pasta makers can be used to makes delicious sausages to go with your fresh pasta or for any other meal. As briefly pointed out earlier, the Magic Mill DeLonghi also helps you produce nicely shaped biscuits. The Imperial pasta machine mentioned above can also do pretzels, cookies, bread sticks and bagels. To conclude this topic on electric pasta makers, it is safe to say that electric pasta machines are the perfect investment for people who want to enjoy fresh pasta rather than buy pasta stuffed full of preservatives from the store. Another thing that makes electric pasta makers such amazing gadgets is the fact that you can practically prepare any type of pasta you can think of depending on the features or functionalities or accessories available with your electric pasta maker of choice. This basically means you can mix it up or match it up whichever way you want. By this I mean you can have one “mix -crate” plate of pasta with all sorts of differently shaped pasta and in varied lengths too. The possibilities and combinations are only limited by your own creativity. These wonderful appliances make everything look and feel quite easy. Pasta experts (and sometimes keen beginners) making their own pasta from home can use these brilliant machines to make fresh pasta dishes in less than an hour. Most of these pasta makers are driven by 200 watt motors, which means they can produce batches of pasta faster than the average person doing everything by hand. Electric pasta makers are reliable and consistent when it comes to mixing dough, rolling it or cutting it to desired shapes and sizes. Get yourself a pasta maker today and change your pasta eating experience forever!